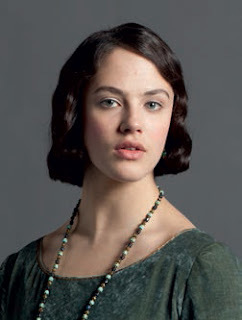 A prosthetic pregnant belly proved the most entertaining prop for Jessica Brown Findlay while filming series three of Downton Abbey. In historical terms, however, the so-called Irish Question now looms large over Downton Abbey, and Sybil and Branson find themselves in the eye of the storm. Inevitably it all leads to changes in her relationships with her two sisters, Edith and Mary: Sybil may be the youngest but she’s also the first of the three to be married and pregnant. For Brown Findlay, Downton Abbey, her first major role, has kick-started a promising film career, including a lead role in last year’s Albatross, playing a tearaway teen with some – but not many- parallels with Lady Sybil. And if she could take one thing she’s sampled in the 1920s and transport it forward to the present day?